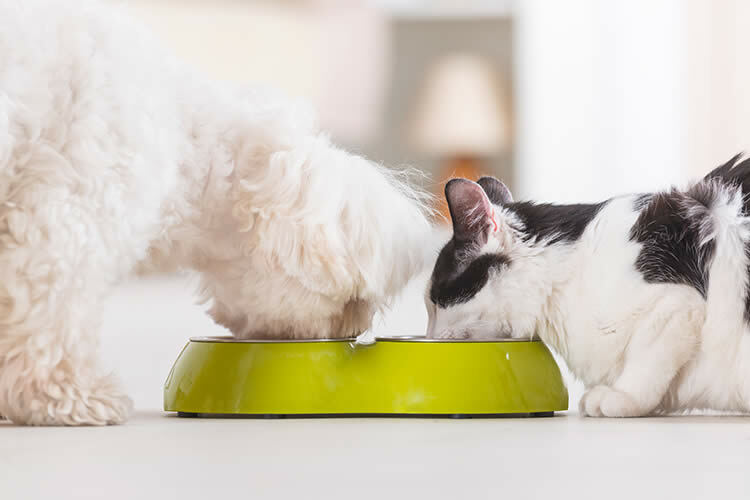 Is It Dangerous for Cats to Eat Dog Food? Dog food is not poisonous to cats and nibbling on it occasionally won’t hurt them. However, cats have different nutritional needs than dogs so they should not be on a diet formulated for dogs. Cats in the wild get all the nutrients they need from raw meat. Since it is ill-advised to feed domesticated cats raw meat, we must make sure the food we give them is nutritionally complete. One significant difference is that feline diets require animal protein. Science suggests that at the very minimum, a third of a cat’s diet should be protein derived from animals. Dogs, on the other hand, can eat a variety of foods, including fruits and vegetables – and can even be fed a vegan diet if it is supplemented properly. The other major difference is that felines cannot synthesize taurine, while canines can. This compound is found mostly in animal tissue and felines in the wild consume it when they eat raw meat. The common house cat’s manufactured diet has taurine added in, as per AAFCO guidelines. While dogs’ manufactured diets may contain some taurine, it is not at a level sufficient for cats. The biggest health risks for cats with taurine deficiency are blindness and deafness. Cats have different vitamin requirements than dogs. Cats require vitamin A, which dogs synthesize. Cats also need a much higher level of thiamine than dogs need and cat food will have five times as much of this compound than dog food. Deficiencies in these vitamins will result in unhealthy eyes, coat, skin, and posture. Severe deficiencies will cause premature death. Doggy Likes Kitty’s Leftovers – So What? Cat food tends to contain more calories per kilo than dog food due to the higher fat and protein content. If you let Doggy eat Kitty’s leftovers, you most likely will have a dog with obesity problems. Likewise, your cat shouldn’t be munching from your dog’s bowl after eating her own food as this will contribute to weight gain. Then What Should I Do? Free feeding your cat and dog is not recommended. They should have set meal times or set amounts given daily. Get your dog on a schedule – meals twice a day are the best for adult dogs. It’s usually easy to monitor your dog’s meal times; they often eat their food in one sitting. Cats are a different story. They like to nibble here and there. Since they often eat a small amount of food several times a day, try to find a special area to place your cat’s food. This area should not be accessible to your dog. Fortunately, the culprit who likes to steal food is usually only the dog – not the cat too. This means you will probably need to find a separate place only for the cat food. If they do happen to eat each other’s food on occasion, it’s nothing to worry about. The danger is only imminent when they are each nutritionally deficient and overweight from prolonged consumption of the improper food. The Nest: Is It Dangerous for Cats to Eat Dog Food? When Do Kittens Stop Nursing? Do Ravens Make Good Pets?